I’ve already called out Bungee Pupee’s shock absorbing leashes as a safe walking accessory earlier this month, but how does it hold up against the might of the golden giant herself? Let’s find out! 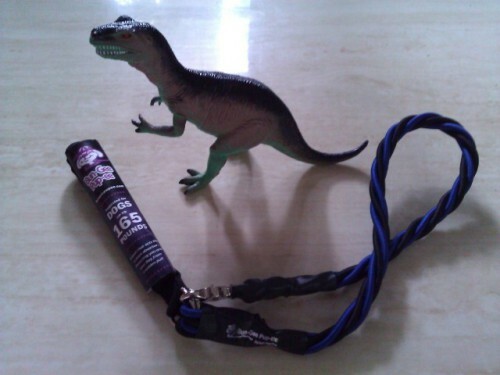 The Bungee Pupee leash that they sent for Jessie to put through its paces is a six foot long blue and black braided leash intended for dogs weighing up to 165lbs. I was instantly impressed with the extremely solid and ergonomic construction of the leash, from its powerful metal harness clasp, to its padded handle and heavy-duty rubber coating on both ends of the leash to ensure that it lasts for an really long time, I instantly felt that Bungee Puppee went well out of their way to create the sturdiest and most comfortable dog leash that I’ve ever encountered. The fact that the glossy and durable interwoven black and blue bungees look really classy is the icing on the cake! 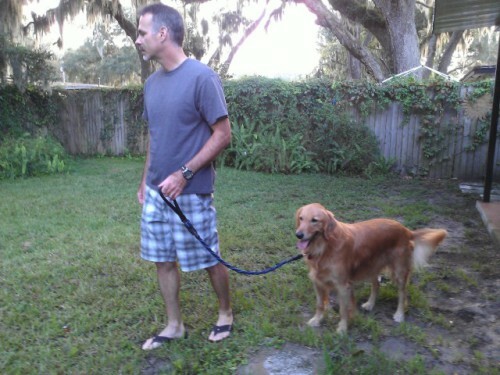 I sent out my dad to take Jessie, our resident golden goliath, out for one of their long daily walks to see exactly how they felt about the biggest and baddest leash from Bungee Pupee, and they loved it! Jessie is a particularly big, strong and friendly dog, who attempts to say “Hi!” (pulls her walking buddy) to every person, animal and inanimate object along the path. Dad noted that he would normally be annoyed by having to steer the massive mutt back on track to finish their stroll with their regular leash, he barely felt her mammoth tugs while using the Bungee Pupee. That said, the only thing that could be improved would be if the leash was a big longer to accommodate the two of them when they went running, so that there’s a big more space between them. However, Bungee Pupee gets a perfect score for being “The best leash for walking Jessie that I’ve ever used.” Congrads, Bungee Pupee! You’ve earned the ultimate seal of approval from someone who walks a golden buffalo every day! If you take regular walks with a big, pulling beast of a dog on a regular basis, there really isn’t a better long-lasting, comfortable and stylish leash than Bungee Pupee’s collection. Happy trails, readers! Animal Replicas by Safari ltd. The Top Three Monthly Mystery Box Services To Spoil Your Pets!